The Tang Paradise is located very close to the Big Wild Goose Pagoda, so when I finished my tour at the Pagoda, I headed to the Tang Paradise, which I heard was one of the newly built tourist attractions of Xian. Unlike all the other tourist attractions I've been too, the Tang Paradise isn't any historical landmark, or contain any ancient, historical relics or artifacts - instead, the Tang Paradise is a cultural theme park based on the Tang Dynasty. The park is modeled after ancient royal gardens so that the tourist can experience the Tang Dynasty culture, and get a glimpse into the life of royalties. In Chinese, Tang Paradise is pronounced "Da Tang Fu Rong Yuan". In front of the main entrance gates to the Tang Paradise. The photo above is taken infront of the main gates of the Tang Paradise. 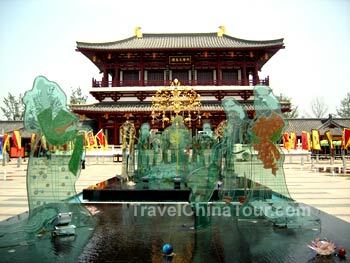 It's a series of glass sculptures set on a black graphite rock with running water that depicts a famous scene called "Ming Huang Meng You Qu Jiang" or roughly translated as "Great Tang Emperor Dream Visits the Qu River". After you pass these sculptures is the ticket office, and it costs $50 yuan to enter. 1st thing you see after entering Tang Paradise. Once you enter the Tang Paradise, at the main entrance area, you'll see a large red and yellow block carved with Chinese characters which writes the name of Tang Dynasty or "Da Tang Fu Rong Yuan". This "block" is created like a seal stamp that stamps the name "Tang Paradise". On the ground infront of the seal, is a "stamp" of the name Tang Paradise. The Tang Paradise is located very close to the Big Wild Goose Pagoda in the southeastern region of Xian city in Shaanxi Province. It is one of the newly built tourist attractions that opened in April 2005. It's a cultural theme park that covers an area of 165 acres that includes a large body of water (about 50 acres). 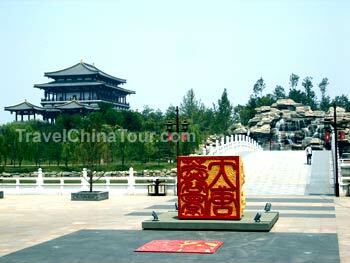 The Tang Paradise is one of the largest cultural theme parks that's based on the Tang Dyansty (618-907AD). The Tang Paradise is a unique combination of ancient history, culture, tradition, with certain modern technologies. One of the main attractions of the Tang Paradise is the water screen which plays movies. Basically, it's a film of water sprayed into the air, with movie images projected on to it.